Vodafone today launches its 2019 Global Trends Report, highlighting customer centricity, ethics and purpose, and the impact of Artificial Intelligence (AI) as key business priorities for the next 12 months. 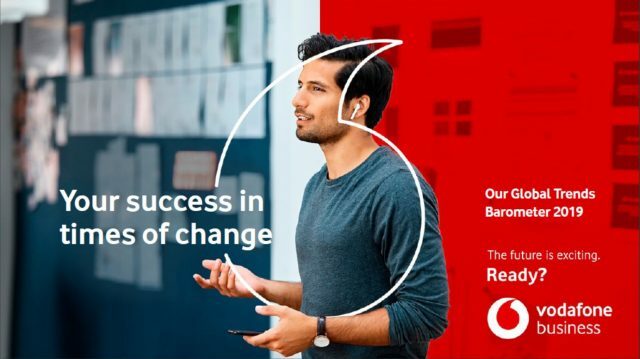 In line with the findings of the report, the refresh of Vodafone’s enterprise division brand – now called Vodafone Business – demonstrates the company’s renewed focus on putting customers and tangible business outcomes at its core. Vodafone has been not just a provider, but a partner for companies, putting technology and innovation to their benefit and improving their processes. Businesses may face next year the challenges and opportunities revealed by the report, so we’re ready to help them succeed in this digital word. We always place people at the center of a business and this is an important aspect which represented a solid foundation of our new brand identity, Vodafone Business”, stated Cristian Giuhat, Enterprise Marketing Director, Vodafone Romania. The Trends Report is designed to allow better understanding of customer needs and challenges and to offer expert insight into how businesses can embrace key trends to their advantage. Drawn from primary research with businesses, industry analysts, global consultancies and futurologists, key findings include several important aspects. Technology-led disruption is putting people at the heart of the business. Businesses need to take a people centric approach by using their employee base to get ahead of changing customer needs in a volatile market and do so at speed. 85% of business leaders agree that the needs of customers are changing rapidly, while 76% agree that they are becoming more powerful and 93% believe that customer expectations are increasing. Another key finding is related to commercial success which is tied to purpose, ethics and trust. With companies going toe-to-toe with price points and new offerings, there needs to be a new way to differentiate between them, and ethics is becoming an opportunity to do this. 93% of businesses agree that they are expected to act ethically by customers, and 92% have this expectation of their own suppliers. 83% of respondents believing that acting ethically ultimately generates more revenue, while 55% of business leaders indicated that retaining the trust of customers is a concern for their business. According to the Global Trends Report, a balance is being struck between human and machine. Leaders are recognizing the need to create an environment that allows people to thrive, supported by automation and machines, and employees’ expectations of the future of work is changing. The findings revealed that 86% of the respondents think that AI will lead to different jobs and 83% think jobs will be more productive. 85% agree that humans will be required to work alongside AI systems. 54% think that the use of AI could lead to discrimination, highlighting the unsettled feelings that automation is creating in the workforce. Vodafone Romania is a subsidiary of Vodafone Group is one of the world’s largest telecommunications companies and provides a range of services including voice, messaging, data and fixed communications. Vodafone Group has mobile operations in 25 countries, partners with mobile networks in 44 more, and fixed broadband operations in 18 markets. As of 30 September 2018, Vodafone Group had 531.9 million mobile customers and 20.4 million fixed broadband customers, including India and all of the customers in Vodafone’s joint ventures and associates.